Ricin toxin is derived from Castor Bean Plant . Ricin is one of the most poisonous naturally occurring substances known. And now Arab terrorists have been captured with it in London. Ricin is a stable toxin easily made from the mash that remains after processing Castor beans ( Ricinus communis ) for oil. Castor Oil was once used as an oral laxative, but is now used mainly as an industrial lubricant and for preparing leather products. Castor beans are grown agriculturally worldwide and the plants grow wildly in arid parts of the United States. Castor beans are slightly larger than pinto beans, darkly colored with light mottling, and have a small light-brown cap at one end. They have been described as looking like blood-engorged ticks. The beans are not normally used as food. Poisoning can occur following inhalation, ingestion, or injection of ricin toxin from Castor beans. Ricin is toxic by numerous exposure routes and its use by terrorists might involve poisoning of water or foodstuffs, inoculation via ricin-laced projectiles, or aerosolization of liquid ricin or distribution of a powder. The seeds from the castor bean plant, Ricinus communis, are poisonous to people, animals and insects. One of the main toxic proteins is "ricin", named by Stillmark in 1888 when he tested the beans� extract on red blood cells and saw them agglutinate. Now we know that the agglutination was due to another toxin that was also present, called RCA (Ricinus communis agglutinin). Ricin is a potent cytotoxin but a weak hemagglutinin, whereas RCA is a weak cytotoxin and a powerful hemagglutinin. It is grown as an ornamental in gardens, sometimes as a houseplant, and also grows as a weed. It is an annual in the south and a perennial in the tropics, and it may reach "15 feet tall outdoors". It is a woody herb belonging to the family of Euphorbiacea (Spurge). Perhaps just one milligram of ricin can kill an adult. The symptoms of human poisoning begin within a few hours of ingestion. Note the key word ingestion - it has to get into your body - via eating, inhaling, or being injected with it. But remember, it is not alive, so it can't spread itself, and light, air and chemicals (notably, chlorox, bleach) will degrade it. Eating Castor beans or ricin-contaminated material causes diarrhea, nausea, vomiting, abdominal cramps, internal bleeding, liver and kidney failure, and circulatory failure. Rapid heartbeat can also occur. If the castor beans are swallowed whole, the poisoning will be less severe than if the beans are chewed. Breathing dust that contains ricin causes cough, weakness, fever, nausea, muscle aches, difficult breathing, chest pain, and cyanosis (blue skin). Breathing the dust can result in respiratory and circulatory failure. Exposure to concentrated ricin particles in the air is only likely during an act of bioterrorism where large numbers of people would likely experience the signs and symptoms in one place and time. Injection of ricin toxin would likely result in tissue (muscle) necrosis near the injection site, probable multiple organ failure, and death. All routes of exposure are very dangerous and can result in death. The time from exposure to ricin toxin to onset of symptoms can range from less than 1 hour to 12 hours or greater. Symptoms of poisoning from eating ricin-contaminated food or Castor beans can occur within 2-3 hours. Inhalation of ricin-contaminated particles can cause symptoms within 3 hours. Sometimes the symptoms can be delayed many hours. abdominal pain vomiting diarrhea, sometimes bloody. severe dehydration, a decrease in urine, and a decrease in blood pressure. It is advisable to keep children away from the castor bean plant or necklaces made with its seeds. In fact, don't even have them in or around a house with small children. If they ingest the leaves or swallow the seeds, they may get poisoned. The highly toxic seeds beaded into necklaces, cause skin irritation at the contact point. Aphids, drawn above on a leaf of the castor bean plant, are susceptible to poisoning from ingesting the phloem. The sap-suckers died within 24 hours of feeding. A study with sheepshowed that autoclaved castor-bean-meal can be incorporated to 10% of sheep rations without any ill effect. There is currently no vaccine or prophylactic antitoxin available for human use, although immunization appears promising in animal models. Use of the protective mask is currently the best protection against inhalation. Manycytotoxic proteinsfrom a variety of plants have been identified, and they are related to ricin both in structure and function. Theyinhibit protein sythesis by specifically and irreversibly inactivating eukaryotic ribosomes. 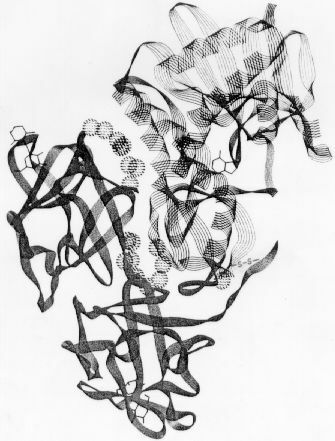 These "ibosome-inactivating proteins" (RIPs) are typically N-glycosylated, 30 kDa monomers (Type 1 RIPs). However, in order to bind to the cell surface galactosides and enter the cytosol to reach ribosomes, they require a second monomer, a galactose-binding, 30 kDa lectin. The monomers are joined by a disulfide bridge to form the toxic heterodimers (Type 2 RIPs). Some plants, such aswheat andbarley, have only Type 1 RIPs, and are not poisonous, while others, such as the castor bean plant seed, contain the Type 2 RIPs that are among the most potent cytotoxins in nature. 5% of the Ricinus seed consists of ricin and RCA (Ricinus communis agglutinin). Ricin begins sythesis as a prepropolypeptide that contains both A and B chains. The signal sequence of the NH2-terminus targets the nascent chain to the endoplasmic reticulum (ER) and is then cleaved off. As the proricin polypeptide elongates it is N-glycosylated within the lumen of the ER. Protein disulfide isomerases catalyze disulfide bond formation as the proricin molecule folds itself. Proricin undergoes further oligosaccharide modifications within the Golgi complex and then is transported within vesicles to the protein bodies. The ricin A portion of the heterodimer is the enzyme that binds and depurinates a specific adenine of the 28S rRNA. The adenine ring of the ribosome becomes sandwiched between two tyrosine rings in the catalytic cleft of the enzyme and is hydrolyzed by the enzyme�s N-glycosidase action. The target adenine is a specific RNA sequence that contains the unusual tetranucleotide loop, GAGA. Ricin is more active against animal than plant ribosomes, and intact bacterial ribosomes are generally not susceptible. Ricin can be targeted to specific cells, such as cancer cells, by conjugating the RTA subunit to antibodies or growth factors that preferentially bind the unwanted cells. These immunotoxins have worked very well forin vitro applications, e.g. bone marrow transplants. Although they have not worked very well in many in vivo situations, progress in this area of research shows promise for the future. Since ricin is an N-acetyl galactosamine-binding lectin, it can be used with different lectins that have different specificities tomap neuronal patterns of glycosylation. When suicide transport is observed after injection of the toxin, it confirms the presence of N-acetyl galactosamine residues on the neuronal cell surface. Strategies in suicide transport work very well in studies of adult peripheral sensory and motor neurons because they are sensitive to ricin. Information for first responders includes Agent-specific identification, medical symptoms, prevention & personal protective equipment, fire fighting, sampling & analytical methods, decontamination, spillage disposal, packaging & labeling information. Includes FAQ's and Emergency Response Card about Ricin.